DMP - Dave's Mechanical Pencils: No 2 Pencil Equals ? No 2 Pencil Equals ? What Does A Number 2 Pencil Equal? A few US folk find this blog with searches trying to relate No 2 pencils to their equivalents in the HB system. I didn’t even know this USA “Number” system existed until a few years ago but since its not the only system operating in the US, I guess it could all get a bit confusing. Here is Dixon marking their pencils as “Number 2, HB, SOFT”. Personally I’ve never thought of HB as soft. If I saw Soft , I would expect B, or 2B. According to the Faber-Castell catalogue, Number 2 = B. But from their countrymen at Staedtler, Number 2 = HB. But the folk at Stabilo have just completely lost the plot, with 1 = 3B, 2 = HB and 2 ½ also = HB! It’s a confusing world that we live in. Who knows what a number 2 pencil is the same as? What do they use in South America, the Middle East and Asia – HB or 2 or something else? If you know, leave a comment. is and Extra-Soft lead. In the US it is generally #1=B #2=HB #3=H I dont know about 2.5s, they seem to be labeled F alot but some say HB and are lighter than a #2. So generally it is safe to assume that #2=HB unless you are getting something from Faber Castell whose HB grade is a little lighter. Yeah, it doesnt make any sense whatever. 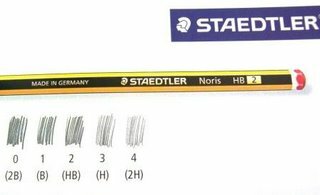 Here in Brazil, FaberCastell9000 and 1250 use only the standard grades for core hardness, but Bic Evolution made in Manaus uses HB=2. Noting today that there may be more than one manufacturer of mechanical pencil leads, it seems possible that HB may be different between makers. It sure seemed that the HB in my Staedtler 777 seemed softer than the HB in the Pentel pencils. Thanks for these comments. I guess it just goes to show there really is no consensus on the relationship between the number system and the HB system, and that one brand of 2/HB can be completely different to another. if number 2 is supposed to be the most suitable hardness for bubble-shading, here in singapore we've always used 2B for shading OMR and pretty much everything else. and i can't imagine all the people shifting from mechanical to woodbase just for the US tests. i seriously dont get it. why the heck do we have to follow these rules? yeah, i totally agree with you guys for the stupid rules part. I think maybe the best solution to this kinda stupid problem is just forget about these bubble-filling tests. We can save trees and money at the same time. Having read my posting again, I realise I haven't actually answered the question, "Does a #2 pencil = HB?". The answer is YES. But...there's always a but. Saying #2 or HB is like saying "RED". What colour is "red"? Imagine if you had to sit your SAT exam wearing "red" clothing. There would be dark red, light red, crimson, burgundy, deep pink, and so on. The point is that HB and #2 are not defined in anyway, they are very vague concepts - if you say its HB then it is. I always use mechanical on "Scantron" tests, and Pentel Super Hi-Polymer HB has consistently worked. I agree that there is probably a rather wide range of harnesses one could use, and still be successful. To be honest, though, I have never seen the "US" numbering system used outside of the context of OMR/bubble filling here in the US. For all other uses I've encountered we use the typical hardness-blackness scale. I live in the US, and all of the mechanical pencil lead I buy is HB. On some of the packages,however, it says "equivalent to a #2 pencil." I am not brave enough to try taking a bubble test with a mechanical pencil. By the way, do any of you remember those "liquid pencils" Those were weird. Only lasted a few years. we use pencils in africa too. we are required us to use mainly HB at different stages of life. Lead grades vary depending on the manufacturer. So one company's "HB" or "#2" is not always the same as another company's. It's rather annoying. I wish there were a recognized standard that everyone adhered to. Here in the US, there is a college entrance test called the SAT (which used to stand for something, but which has been changed to stand for "S.A.T" to avoid controversy). The SAT requires a #2 pencil, despite the fact that softer pencils offer a significant advantage in filling out the little ovals. Pencils are actually advertised to be SAT acceptable. I sent my nephew with a handful of #2s and an old "Test Scoring Pencil" with a well-rounded tip, hoping the proctors wouldn't look closely. They didn't. I'm not saying it helps a lot, but if you're worried about every point and every second, it helps. This lack of a hardness standard bugs me some ways and not others. Sure it'd be nice for everyone to be the same. But I just don't think it's going to happen. The hardness creep is especially annoying because when people test them, I find they gravitate toward the softer, darker leads. 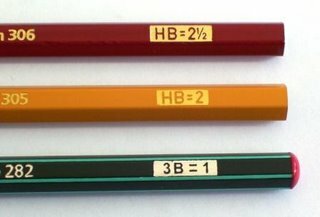 My guess is pencil companies are told by stores they only want HB #2s, but the companies know can differentiate their product from the others by dropping B or 2B leads in the pencils. One test I want to try is to take notes with a variety of pencils in my planner, and then walk around with it for a month and see how badly they smear. My hypothesis is that HB seems to be the magic point where the pencil is dark enough, but doesn't smear too much. Personally I see a lot more cheap Chinese MPs being sold with 2B leads. I think the leads are really more like HB, they just label them 2B - because they perceive a darker lead is more desirable? I travel back and forth between Beijing and Hong Kong. In both two cities, people use the European system (HB, B, 2B, H, 2H etc.). I used to use B lead to take notes in high school. It was definitely easier to write with but would smudge significantly as I studied the notes. I took my MCATs and SATs with mechanical pencils and HB lead. No problems. I score standardized tests, and the only magic about a #2 pencil (or HB) is that it is a compromise between darkness and erasability. Soft/dark is easily read by a scanner, but is sometimes difficult to erase completely and so an erasure might be read as an intended answer. It also may smear more, which can also throw off the scanner. Truthfully, students should probably worry more about having really good erasers than magic pencils! I have seen many tests where "erasures" were just big smears. Back in the day when I was manually drafting, my preference for everyday use was F. It is not the easiest to find in retail stores, but a local office supply store carries .5mm Pentel F lead, since so many of us in engineering at my company used it and still do. HB will do, but F is better IMO. i've always been told that #2 = HB. i take scantron tests and do all my coursework with 2B lead in my p205. i have yet to have a problem with the scanner. a previous poster had the point exactly. erasers are key to the use of softer lead. a grimy pink rubber ball covered in pocket lint is just going to turn a 2B bubble into a nasty black smear that'll never go away. ... but imo, if you're kicking your way to the top of an engineering degree, you had best put some effort into preparedness and neatness. a quality plastic eraser will erase a 2B bubble perfectly fine. i just used my staedtler B and 2B pencils on the SAT. but i was only supposed to use #2 pencils. are B and 2B #2 pencils? Yes - see the sidebar link "No 2 Pencils and Scantron Bubble Tests". I'm in Germany having the same problem as the rest of you. The packaging I've found says #2=B, but the others are right that there just isn't a solid standard that is adhered to from company to company and country to country. I called College Board, the company that makes and grades the SAT, directly and was told that it really doesn't matter. B is fine. HB is fine. Just be sure you use a pencil and fill in bubbles completely. If you have questions you can also call College Board directly, though they have no international toll-free number. Good luck to you all! I've done loads of tests and find that HB is slightly harder and lighter than no. 2, while B is slightly softer and darker. Strangely, just today, my daughter took the SAT and was told that nothing but a wooden no. 2 pencil was allowable for any part of the exam -- not even for doing scratch mathematical calculations in the exam booklet! This whole insistence in the U.S.A. on wooden, no. 2 pencils for exams is antiquated and absurd, as is the U.S.A.'s continued use of the English system, as opposed to the metric system. Quick question to anyone who can answer--I used a No. 3 pencil to fill out information on a recent AP test (not the actual test part, just school codes and such). Do you think this matters? Will the machine be able to read it? Thanks for your help. As long as you make a mark that's not red or blue and is dark enough to be seen in normal daylight without squinting then the machine can read it. Pencil grades aren't even standardised between makers. The Faber Castell B, Staedtler HB and Derwent HB are all about the same density. Pentel is about half a grade darker and Uni a tad darker again. Of course this also varies with paper and hand pressure and writing angle. So stop worrying about the pencil, guys, and concentrate on getting the answers right. I now carry HB (#2) pencils to exams to lend to panicking students. Good advice Sapphire, and also read the linked article "No 2 Pencils and Scantron Bubble Tests". Yeah, thanks. It was just one of those things that keeps bothering you after the test. You've got to worry about something, right? But thank you guys!!! In SouthAmerica is more common the HB standard. I have never in my life heard of there being any problem with scoring a test using a mechanical pencil, provided one uses a lead dark enough to register to the photographic sensor. Anything close to HB, F, B, #2, #2-1/2, #1, should be perfectly fine. 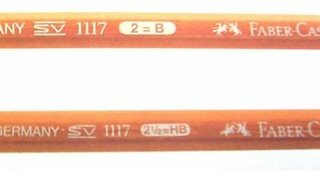 I used to be the buyer for an art supply store, and I have never once seen an HB pencil marked as #2-1/2; the only #2-1/2s I've seen are marked F.
Granted, I haven't taken a College Board test in almost 30 years, but I assure you I used mechanical pencils for them. I went to Stuyvesant High School, where you take an electronically scored test to get in, take NY State Regents tests every year or you don't pass the class, where Drafting is a required course (or, was, anyway, not sure if it still is, but I suspect it's all CAD, now), PSATs, SATs (multiple times), AP exams, Achievement Tests in multiple subjects (ACHs). All of these tests are scored by electronic eye. Never once have I ever heard of anyone having a problem with a test not be scored properly because of a problem with a pencil lead. And I also assure you that my scores on the relevant tests were enough to get me into any college in the world, and I passed every Regents test with flying colors. I even took a city-wide test in German given by the Goethe Institut and was one of the two top scorers in the city, along with one of my classmates. Good thing the teacher knew we both actually spoke German well, because my classmate sat right in front of me! I lived with my German great-grandmother, and she gave my German a real workout at home. A #2 pencil is used because it's the most common grade, and it has a good balance between darkness and durability of the mark (it doesn't smear much, which can be an issue with multiple pages being handled multiple times).